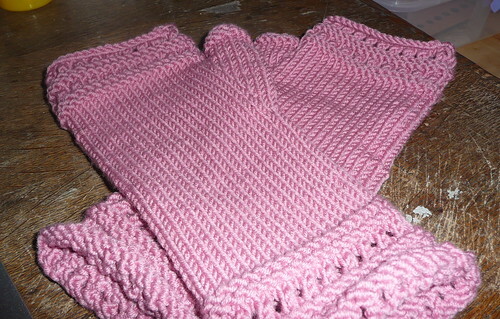 I am feeling quite productive at the moment, I managed to get my pair of Susie's Reading Mitts finished yesterday. They are nice and cosy for when the house is a bit chilly or for running to the garage to go to the tumble drier or the freezer, very handy to have around. I do have a couple of bits of the yarn left over which is annoying as I was trying to banish it from my stash, I am going to knit a few mug warmers that I downloaded from this Etsy shop a couple of weeks ago. I got the Lace rib and the twisted rib versions which should keep my hands warm but not burnt when getting my Starbucks!